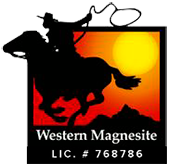 Call or submit our online form to request an estimate or for general questions about Western Magnesite and our services. We look forward to serving you! Please give us the address to the property you are inquiring about, if you are requesting a quote, including the city.